My husband suggested we take down the tea pots. The idea of taking down the tea pots seemed bold. Exciting. Like taking control. When we moved into our second apartment, with my in-law’s help, we did a lot of work fixing that place. We refinished the wood floors, hung wallpaper, etc. My mother-in-law found this lovely blue color to paint the kitchen that I loved so much, I painted the kitchen in our house the same color. She also found a tea pot border. It really cheered up the kitchen. Then she found the matching clock. All this coordination made me feel really grown up. Married about two years, still in my first real professional job, and now I had a kitchen with a wallpaper border and a matching clock. 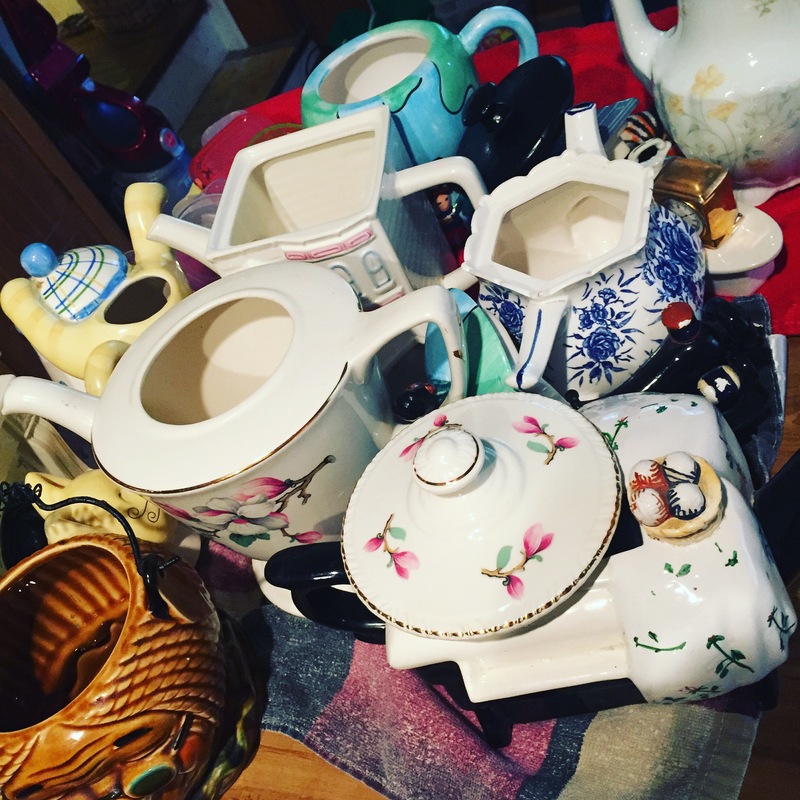 Then the teapot brigade started. I’m not sure how… But we started displaying tea pots on top of the kitchen cupboards in the space under the ceiling. And soon everyone gave me tea pots. I never wanted to collect tea pots. I never NOT wanted to collect tea pots. But somehow, tea pots came and even made it to the top of our cupboards in our current/own house. I washed them today. My husband suggested it. And he implied maybe I shouldn’t put them back. I think maybe he’s right. You see, we’re no longer 20-something newlyweds and neither one of us really cares about the tea pots. And I’d like to own less stuff and make some positive changes in my life. So maybe tea pots are a first step. I have lots of clutter here if you feel the need to purge. I have no attachments to most of it.